Since my visit to Mumbai was cut short, thanks to KSRTC’s ‘truck’ class ride from Bangalore, I decided to return back to Bangalore on Sunday morning from Pune. However, a visit to Mumbai was still on the cards and I decided to meet up Saurabh who was insisting to meet him up. I had to reach Borivali and with tons of buses available to Mumbai from Pune, it was always a difficult choice to select a particular operator. I had tried Shivneri service before (twice) from Pune to Mumbai and both the times the service was very average. However when it comes to time management, they are the number one operator on this route. Anyways, I wanted to try a different operator this time and with few suggestions (thanks to bus fans on FB) the only other name that was on the menu was Purple. 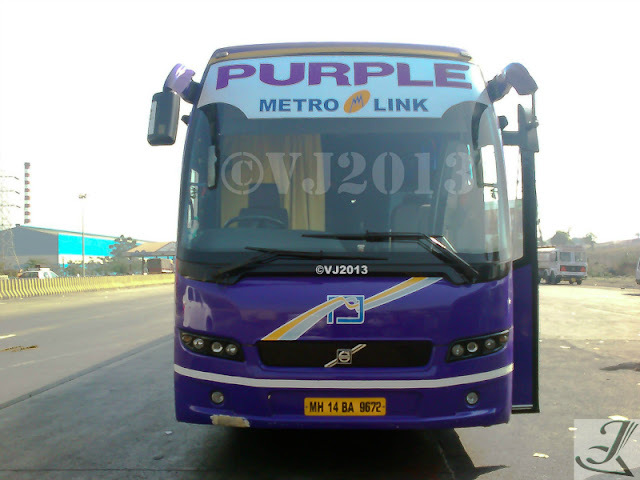 Purple Metrolink has a bus to Mumbai –Pune-Mumbai at an interval of every one hour and I had observed the same during my last visit to Mumbai in July 2012. 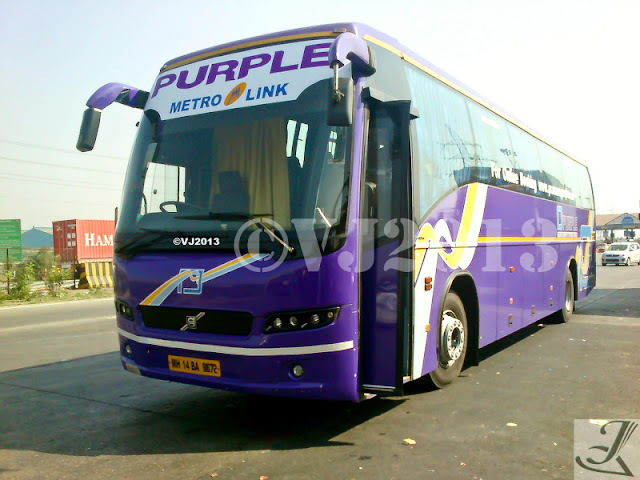 They operate Volvo and Mercedes Multi axle buses from Pune-Mumbai-Pune and also have services to Ahmadabad, Baroda, Indore etc. My friend dropped me at Purple’s office near Swargate. I went ahead and booked a window seat at the second row. The scheduled time of departure was at 11:30pm and I was told that the boarding was at Wakdewadi, at their main office. A pick up van dropped me and another passenger to Wakdewadi at 11:25pm. Here my bus was waiting for her passengers. The driver opened the door and asked the passengers to board the bus. I noticed a board put up in the bus stating, all Luxury buses are prohibited to enter Pune city and the last point for these buses are at Kothrud (by Pune Traffic police). The bus was almost full and we finally departed at 11:50pm. The cleaner came in and checked our tickets as the bus slowly moved out of the city. We stopped at Wakad and few more passengers boarded the bus. There was a line of Shivneri and Neeta buses waiting here. As soon as the remaining passengers boarded our bus, we began to move. The cleaner announced that the bus won’t be stopping for a lunch break on the highway. Few passengers were not happy however there was one passenger, who was extremely happy hearing this news, (MEJ). Since I was already running late, a lunch break was the last thing I wanted. We took the Mumbai-Pune Expressway and the driver meant business. Our bus was constantly doing speeds close to 90-95kmph. However MSRTC’s Shivneri services showed no mercy as they overtook our bus at regular intervals. A recent bollywood flick was being played on the entertainment system.We stopped for a 5min bio break near a food mall on the highway. At the end of the 5th minute, the driver was back in the bus and started honking. (Now that’s what I call time management). Traffic was relatively moderate when we reached Panvel and it continued the same way all along. I called up Saurabh when I reached Sion and he had a discussion with our cleaner regarding my drop off point at Kandivali. I was dropped off at Kandivali at around 3:45pm. Overall, I was very satisfied by the operator. The crew was well behaved and was courteous and helpful to passengers, especially while loading and unloading the luggage from the luggage bay. Even the driving was sedate, no risky overtaking or over speeding anywhere along the highway. Though I am not a frequent traveler on this route, I would still give a 4/5 rating for this operator. Nice information given here about bus from Pune to mumbai. Both cities are well connected. VRL Travels provide best services from pune to mumbai.